COUNTLESS hours on the road and in the air are simply part of West Australian Chelsea Randall's weekly routine to play the game she loves. Whether it's behind the wheel on a 13-hour drive or shelling out $600 to fly to Perth, she's determined to run out with her club Swan Districts. It's an extraordinary feat of endurance then that Randall has the strength to line up as a forward for Western Australia's team in an AFL women's exhibition series game at Etihad Stadium on Sunday. The 24-year-old, who lives in the mining town of Newman in the Pilbara region, will have logged some 4500km this week to play what she eagerly describes as potentially "a cracker of a game'' against the Western Bulldogs. After a five-hour road trip back to Newman and a good night's sleep, she was up early to catch a flight to link up with her West Australian teammates for a four-hour, 2700km trip to Melbourne. The three-time All-Australian forward trains with local men's teams the Tigers and the Pioneers at Newman, where she runs V Swans, a community development arm of Swan Districts that instructs school children in the basics of football and netball, kicking and shooting goals. "The program basically engages kids and teaches them about the importance of attending school, setting a good example in behaviour and becoming community leaders," she said. "It's such a beautiful community. Once you say you play football, it means you can play netball, soccer and touch rugby, so you become involved with everything in the community." Remarkably, Randall has managed two games with Swan Districts this season and played for the West Coast team that beat Fremantle in a state academy exhibition game prior to the Eagles-Dockers derby at Domain Stadium early in the season. "It's quite challenging. Because I'm involved in football, I train with the local men's teams. I also run a development squad, so I jump in there and have a run with the kids,'' she said. Several times, Randall has made the 13-hour road trip from Newman to Perth with her faithful border collie-labrador cross Koda to play with her home club, before heading back up the lonely 1200km of the Great Northern Highway. "It's nice to get a touch of the footy and catch up with the girls. But there was one occasion when I just couldn't go on (with the drive). So I pulled over and rolled out the swag and snuggled down with Koda. She would look after me,'' she said. In her precious little spare time, Randall is studying an online course for a bachelor of education in physical education. She also has mentored her own trainee, who went on to win AFL SportsReady's Rising Star Award. 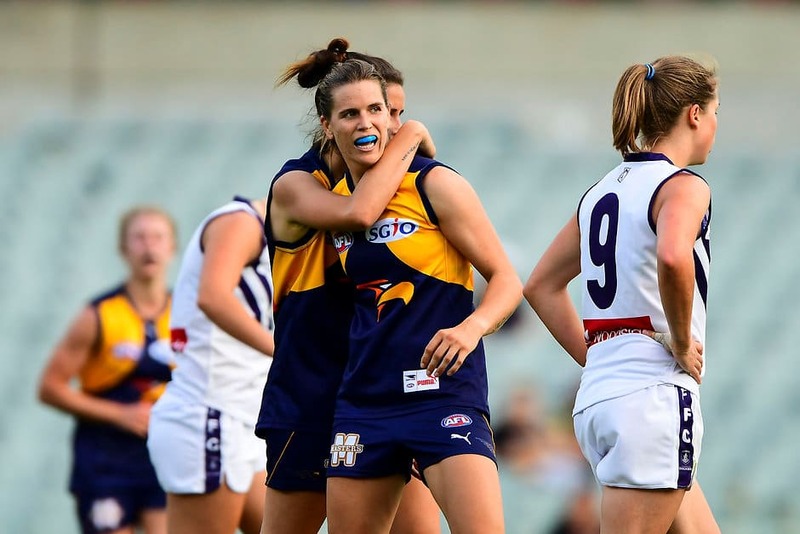 Randall's contribution to spread the football gospel was recognised when she was awarded the Jill Lindsay scholarship at an AFL women's lunch in the Docklands in early May. "It was so overwhelming to meet such incredible people who love our game. That was pretty exciting. And then to be announced as winner of the Jill Lindsay scholarship was very humbling and such an honour,'' she said. Go to AFL.com.au/womens for live video and audio streams of the match, plus a match report.